We’re just five days into ICESCAPE’s 2011 campaign, but Kevin Arrigo of Stanford University in Palo Alto, Calif., has already been putting in long hours to keep a complex mission running smoothly. From the U.S. Coast Guard Cutter Healy, Arrigo stepped away from the lab to share his thoughts about his role as ICESCAPE’s chief scientist. ICESCAPE: What is chief scientist? Arrigo: Basically my role as chief scientist is to make sure the science gets done. If there’s a decision that needs to be made in terms of conflicting priorities for example, it’s me who determines which of the priorities is the priority. There are a lot of constraints in a cruise like this, particularly time. In many ways it’s a facilitator role. ICESCAPE: What is the goal for this campaign compared to last year? Arrigo: One thing we’re looking for is to see how things differ from year to year. This year, we had the option of sampling completely different places or coming back to the same places and it’s always better to resample places you’ve sampled before. That way you can start building up a time series and see how things are changing over time. There are also new things we want to do up north when we get into deep waters. For me it’s the connection between the deep basins where the nutrient reservoir is and the productive shelves and how the waters exchange between them, so that’s my big picture. The other big picture is collecting as much optical data as we can to allow the satellite algorithms to be improved as much as they can so we can improve our ability to view this system from space. ICESCAPE: Why are you interested in this work? Arrigo: I’m interested in the climate angle. I’m an ecologist by training. Most of my work has been done in the Southern Ocean. Changes, however, are going on much more rapidly here and so, like a lot of people, I want to understand the implications of those changes. Particularly, I’m interested in the base of the food web — a hard thing to see. It’s really easy to see what’s happening to the polar bears. It’s really hard to see what’s happening to the little critters that feed the entire ecosystem. I think that’s one of the most important things we have to understand because if we don’t understand what happens with them we don’t understand the system at all. So for me, it’s a lot of intellectual curiosity. I love to understand how systems work. I was trained as a systems ecologist and so I like to see how all the pieces fit together. The Arctic is a really important piece of the whole global picture. But even as a system itself there’s lots of little pieces we don’t understand very well, how they fit together, and that’s what I’d like to get out of this. ICESCAPE: It’s early in the cruise, but have you had to make any major decisions? Arrigo: Early on we had a lot of problems. Last year things went perfectly, everything worked the first time. This year a lot of things didn’t work the first time. For example, when we did our shakedown station the winch [which lowers the water sampling device over the side of the ship] didn’t work. We had the option of going to the first station and trying it then. I was uncomfortable with that, so I decided we were just going to stop, get the winch in the water, and make sure it works. That way if it didn’t work we would have a few hours to fix it. Fortunately everything went perfectly smoothly when we got to the first station. I have also had to be creative in terms of the sampling order so that we get to the places we want to be at the times we want to be there. For some stations, it doesn’t matter when we sample them. For others, we absolutely want to sample them at a particular time of the day. There’s a bit of a juggling act that goes into getting that right. ICESCAPE: How many stations will we sample? Arrigo: Now we’re at station 12. Last year we did 140 stations and we had figured to do 70. How many stations we do this year will depend on what happens up north. I doubt if we’ll do 140 again. If the ice allows, we’re going much farther north and into much deeper water. Here the water depth is 25-50 meters so whenever we do a station and drop our instruments down, we don’t have to drop them very far. But we’re going to get into waters that are not 25 meters deep, they’re 3,000 meters deep, and then you’re literally sitting there for hours waiting for the instruments to go down and come up. ICESCAPE: So far, have we seen anything interesting in the data? Arrigo: What you saw me doing down there was the first analysis of the pigment data. So far, it seems to be really different from last year in terms of just looking at the profiles. There’s a water mass that comes through the Bering Strait that carries most of the nutrients through. We caught that last year and we didn’t see it at all this year, at least it doesn’t look like we’ve seen it at all this year. It’s probably there, but it’s probably just too far to the west and we didn’t get over far enough to actually see it. Its always nice when you do a cruise two years in a row to see interannual differences, it helps you understand how the systems work better. But it’s really early and I don’t know that anybody has gotten any real data yet. Tomorrow! ICESCAPE: What is the plan for tomorrow? Arrigo: It’s going to be really hectic over the next 36 hours. Now we’re doing basically 18 stations over 48 hours. We started early this morning and will continue all the way until sometime day after tomorrow, early in the morning again. Then, things are going to slow down as we have a 13-hour steam to the next stations. We’ll be doing maybe one more full station before we start heading north again where things will start getting a lot more interesting. Within five to six days I suspect we should be in the ice. ICESCAPE: Have you ever worked in the Arctic? Arrigo: ICESCAPE is my first Arctic field campaign. It’s really different, its much bigger in scope than anything I’ve ever done before. It’s a big group, a lot of science, and very interdisciplinary. There are a lot of very bright people doing a lot of different, interesting things. And that’s what’s attractive for me — we’re going to get a lot of the little pieces that I’ve been so curious to see how they fit together. But it’s a complex system and it’s a complex group, which meshed really well last year and I’m sure it will mesh well this year. I’ve never been chief scientist before so it’s a whole different perspective. ICESCAPE: What goes into being chief scientist on a mission like ICESCPE? Arrigo: I remember before I did it I was really nervous about it. I didn’t know if I was going to like it, I didn’t know if I was going to be good at it, there were a lot of unknowns. It’s a lot different than I thought it was going to be. There are a lot of little things … questions coming from all over the place. Even though it’s a big picture job being chief scientist there’s just a lot of little details that you have to keep straight in your head and it’s a real challenge because you have to be sharp all of the time. The work schedule is its really hard because there are a lot of long hours and long days. I feel fuzzy headed certainly by the end of the shift and then I have to make decisions for the whole ship. It seems a little daunting at times. But I found that I really enjoy it. I enjoyed these cruises much more than I’ve enjoyed any other cruise I’ve been on. ICESCAPE: What kind of hours do you keep? Arrigo: I usually work 8 a.m. to midnight and maybe run for a little bit during that time on the gym’s treadmill. But there’s always stuff going on. I was up for the first station at 2:30 a.m. and then I wanted to make sure that the second station worked in terms of sampling and timing so I stayed up until 4 a.m. and then got back up at again at 8 a.m. That was a tough day. Was that yesterday? It seems like forever ago but it was only yesterday. So I try. The last thing I can afford to do is burn out. 16 hour or 18 hour days are ok. You can do that for five weeks but you can’t do it any longer than that. ICESCAPE: What are your plans after the cruise? Arrigo: I’m going to Hawaii with my wife and son as soon as we get back. We did that last year too, it was great. But the cruise certainly hasn’t gotten to the point — nor did it last year — where I was like “when is this thing going to end?” I was disappointed when it ended last year. I think this year will be a little different because we’ve done it already and it will be a little more familiar and a little less exciting. But hopefully when we do all of the new stuff up north everybody will get jazzed up again. Tech Tuesday: Where are We Going? From space, satellites observe all kinds of aspects of the Earth system. They can track the extent of sea ice, measure sea surface temperature, and even take pictures of the ocean’s microscopic organisms. If that’s the case, why are we at sea on the Healy? Earths’ systems are exceedingly complex. 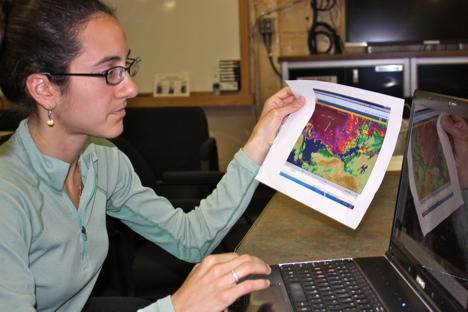 To improve measurements collected from space, scientists on the Healy will sleuth out complexities right on the scene. For now, however, satellites direct our decisions as to where — and when — we’ll be collecting that data. 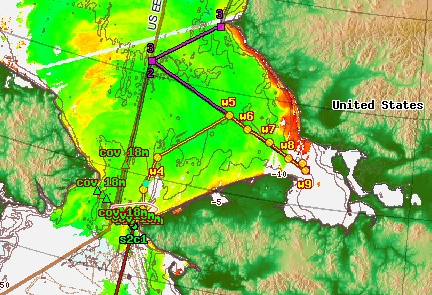 Data from NASA’s Aqua satellite show scientist on board the Healy the location of phytoplankton blooms. In 2010, ICESCAPE sailed through the Chukchi hotspot, a surprisingly intense phytoplankton bloom in the Bering Strait. “We measured about 50 micrograms per liter, the highest concentration of chlorophyll that I’ve ever seen anywhere in the world,” said Kevin Arrigo, ICESCAPE chief scientist from Stanford University. From space, the blooms show up as green swirls on images from the MODIS instrument on NASA’s Aqua satellite. The pictures reveal the location and timing of microscopic organisms afloat in the sea, the base of the food chain and key players in the carbon cycle. This week, satellites show that the Chukchi hotspot isn’t so hot. By midday on Thursday, June 30, we should be on site to collect a full suite of measurements to find out why. If the bloom previously peaked, we should see remnants at depth. 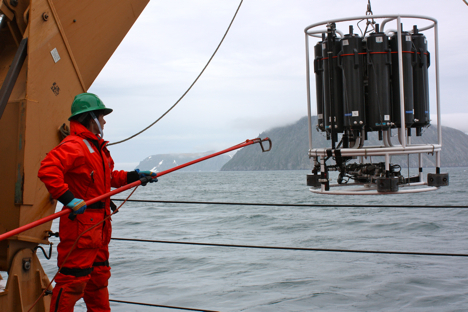 Scientists on board also want to study how the blanket of sea ice impacts Arctic ecosystems. But where’s the ice? 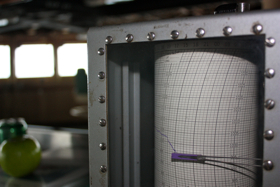 Today we’re passing through the Bering Strait and stopped for a full suite of measurements near the Diomede Islands. We’ll keep pushing north and should start encountering ice any day now. Some charts show that we could see small ice patches as soon as tomorrow. Any significant ice, however, might not turn up until the end of the week. We know the whereabouts of sea ice thanks to ice concentration maps from sources such as AMSR-E on NASA’s Aqua satellite. Last year our progress north was blocked by thick, multiyear sea ice pulled south by the Beaufort Gyre. Satellites show that, so far, ice should break up enough so we can get a look at ocean, ice and ecosystem interactions deeper in the Arctic basin. On June 23, the Healy’s main lab (above top) resembled a skeleton … the framework supporting the science of missions past, present and future. By June 26, the main lab (above bottom) took on new life. 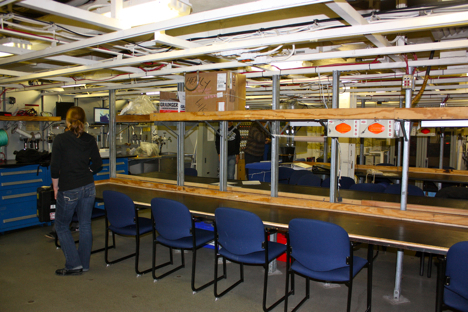 Purposefully arranged on lab benches are systems to process water from the ocean and sea ice. They identify the water’s chemical constituents, count its phytoplankton, and store measurements of reflected and absorbed sunlight. 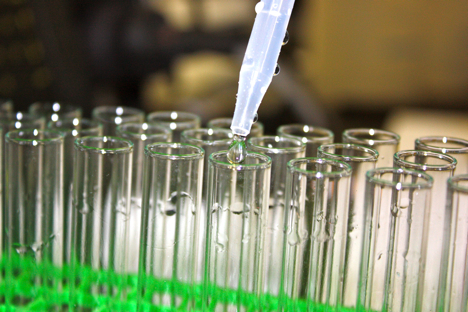 Setting up lab is a critical, early step to a successful mission. Did the instruments arrive in once piece? Do we have everything we need? 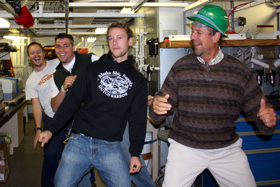 Once at sea that drill bit or software update can make or break the five-week-long experiment. Finally there’s the pressure of having everything in place before reaching the first sampling station on June 27. Like bees in a hive, scientists swarmed the lab and knew just what to do. Crates reached their destination via the ship’s cargo lift. Tape labels adorned empty glass bottles. Bungees hugged lab equipment tightly to shelves. Chaos become order. At 9 a.m. on the bridge of the Coast Guard Cutter Healy, Seaman Burgeson stood with binoculars and scanned the horizon for vessels. Every few minutes he flipped a switch, asking wipers to clear the spray from an increasingly agitated sea. The mood was heavy as Coast Guard crew prepared for SAR, or “search and rescue.” Earlier this morning the ship was just southwest of Nunivak Island, Alaska, when crew diverted the Healy from its northbound course and headed back south toward a tug boat in distress. Beacons onboard the tug boat Aries indicated contact with water, but the implications were uncertain. A C-130 and helicopter flew to the scene for airborne assistance, while the Healy prepared for rescue and assistance from the sea. An update at 11 a.m. revealed that the Aries was sinking and that four people aboard had evacuated to the adrift barge. The Healy pressed on and expected to be on the scene by 6 p.m. for back up and assistance. At 2:15 p.m., Healy crew announced that a Coast Guard helicopter successfully rescued all four people stranded on the barge and returned them to safety. No longer needed on the scene, the Healy turned around and resumed its northward course. The rescue is not the first drama to unfold for ICESCAPE scientists. 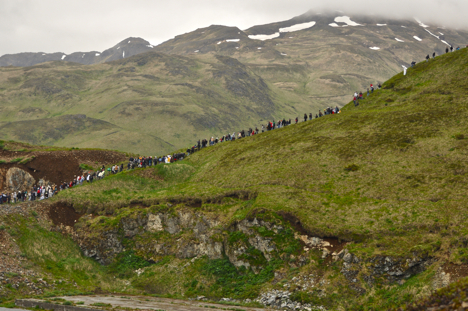 Two days before embarking on the mission, scientists at port in Dutch Harbor, Alaska, drove, ran or hiked to higher ground after a tsunami evacuation was ordered on June 23 after a magnitude-7.2 earthquake stretch the Fox Islands in Alaska’s Aleutian Islands. Relieved, we descended the hills when it was clear that a damaging wave did not materialize. And for the most part, the mission so far this year is going well. 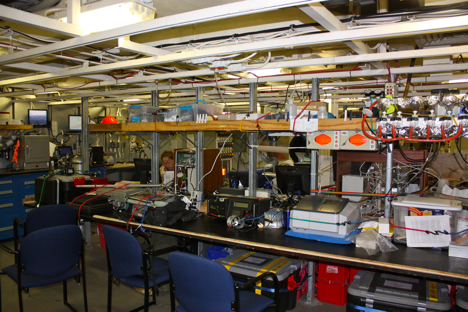 In a single day, instrument teams turned the ship’s lab from an empty to bustling space full of sampling and testing equipment bungeed or drilled into place (a necessity at sea). Discussions are peppered again with talk of bottle washing, phytoplankton counting, and ice coring as we re-approach our first science station at the mouth of the Yukon River. 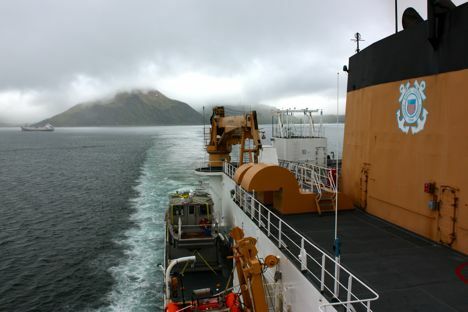 DUTCH HARBOR, Alaska — Low clouds and damp, chilly air did little to stifle the anticipation of 47 researchers onboard the U.S. Coast Guard Cutter Healy as it powered away from Dutch Harbor, Alaska. 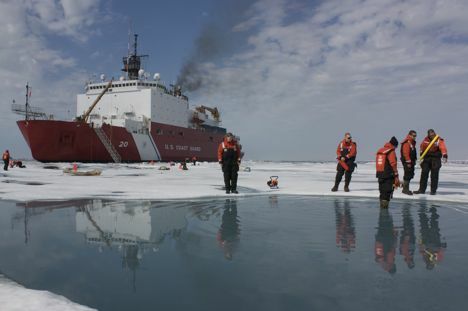 At 8 a.m. local time, the icebreaker, scientists and crew forged north, marking the start to NASA’s 2011 ICESCAPE voyage. The goal, simply, is to collect data from ocean and sea ice stations to find out how changes in the Arctic — particularly the changing sea ice — affect the ocean’s chemistry and ecosystems. It’s a job that NASA does from space, providing coverage over the entire Arctic region. To better understand what satellites see, however, we need boots on deck and on the ice to tease out the Earth system’s complex connections and processes. A few final glances back to shore and we turn our sights ahead. For five weeks we’ll be living together, eating together, and executing a well choreographed dance of data collection and analysis. See the mission’s drama unfold as we relay the process of scientific discovery, both its challenges and successes. We present our favorite image of the week along with background information putting the image in context with mission science. Shows off some of the cool instruments and gadgetry that make ICESCAPE science possible. Who are the people behind the mission? 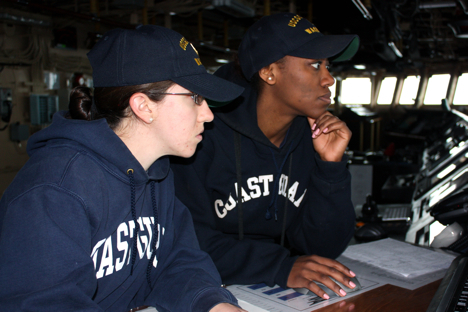 Here we profile a scientist or crew member with a series of question and answers. So you’ve seen the pictures, but what does research aboard an icebreaker in the Arctic sound like? ICESCAPE is not the first scientific mission to study the Arctic. How did we get to this point? How will ICESCAPE continue the legacy? NASA&apos;s Arctic Voyage Resumes, Welcome Aboard! 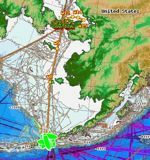 On June 25, NASA’s ICESCAPE mission, or “Impacts of Climate on Ecosystems and Chemistry of the Arctic Pacific Environment,” resumes its shipborne investigation of the impacts of climate change in the Chukchi and Beaufort seas along Alaska’s western and northern coasts. 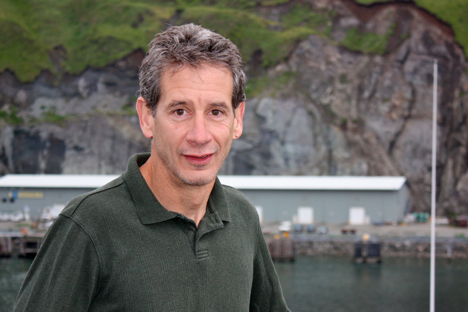 Follow our daily blog posts from the Arctic voyage starting on June 25, when the research teams depart from Dutch Harbor, Alaska, aboard the U.S. Coast Guard Cutter Healy. We’ll bring you a behind-the-scenes look at ICESCAPE mission science and icebreaking adventures, as well as some Arctic history. Also, meet some of the 47 scientists onboard for the five-week mission studying how changing conditions in the Arctic affect the ocean’s chemistry and ecosystems. Author earth2nasaPosted on June 26, 2011 March 19, 2013 Tags ICESCAPE 20111 Comment on NASA&apos;s Arctic Voyage Resumes, Welcome Aboard!